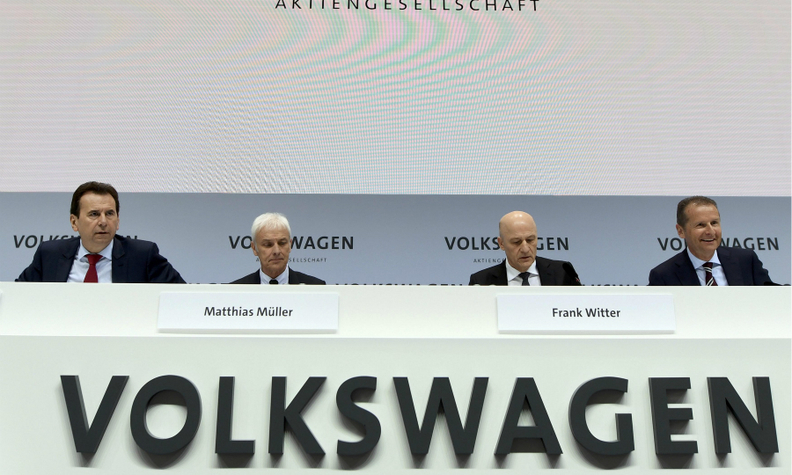 Volkswagen CEO Matthias Mueller (second from left) and other board members attend the company's annual news conference on Tuesday. WOLFSBURG -- Volkswagen Group said it was capable of shouldering the costs of its diesel-emissions crisis even as its core VW brand continues to struggle and profitability is falling at Audi, the automaker’s biggest earnings contributor. The 12-brand group had a record underlying profit last year, helped by strong results at its Porsche and Skoda brands. "We see good chances of being able to ride the wave of the positive performance last year," CEO Matthias Mueller said on Tuesday at the carmaker's annual news conference. VW expects group revenue to exceed last year's record 217 billion euros ($231 billion) by as much as 4 percent this year and is forecasting an underlying operating margin of between 6 and 7 percent, compared with 6.7 percent in 2016. The prediction affirms VW's forecast given on Feb. 24 when it said provisions for the diesel scandal had risen to 22.6 billion euros ($23.9 billion). "You can rest assured that we will do everything in our power to make 2017 an even better year than 2016," Mueller said. VW said it aims to moderately exceed last year's record 10.3 million deliveries when it overtook Toyota Motor to become the world's biggest selling carmaker, but the company appears to be making slow progress in tackling its biggest trouble spot, the long-planned turnaround of its core autos division. The VW brand's operating profit slipped further to 1.87 billion euros in 2016 from 2.10 billion a year earlier because of higher marketing costs related to the diesel crisis and plunging demand in Brazil and other key markets, finance chief Frank Witter said. The brand's sales revenue declined by 0.6 percent to 105.7 billion euros. The operating return on sales before special items dropped slightly to 1.8 percent from 2.0 percent, well behind the brand's goal of a 4 percent margin by 2020. The VW brand, which is bearing the brunt of the crisis fallout, improved profitability to 625 million euros in the final three months of 2016, turning around from a loss of 127 million euros a year earlier as restructuring efforts gradually show signs of progress. Cost cuts and record sales helped lift the quarterly margin to 2.2 percent from 1.6 percent a year earlier. Although VW Group as a whole has bounced back from the scandal, analysts view a turnaround at the VW brand as key to its prospects. The brand accounted for almost half of group revenue in 2016, but only just over 10 percent of underlying operating profit. The brand struck a deal with unions in November to cut jobs and target 3.7 billion euros of annual savings by 2020 in an effort to lift the profit margin. Squabbles over the cost-cutting implementation have sowed doubts among some analysts about whether the targets will be achieved. "In times where most other car companies are improving efficiency and shaping the industry, VW needs to be very mindful not to waste any more time with internal power struggles," Evercore ISI analysts said in a research note to clients. Results from the group's other brands saw Skoda's operating margin exceed that of Audi. Skoda's 2016 operating profit increased by 31 percent to 1.2 billion euros. Sales revenues increased by 9.8 percent to 13.7 billion.The brand's operating return on sales rose to 8.7 percent from the previous year's 7.3 percent. Audi's operating profit before special items dropped to 4.8 billion euros from 5.1 billion last year. Sales revenue was 59.3 billion euros, 0.9 billion higher than the year before. The brand's operating return on sales before special items was 8.2 percent, down from 8.8 percent. Audi’s results were hampered by a 1.8 billion-euro charge for its role in developing tainted 3.0-liter diesel engines, and the luxury-car unit also faces increasing pressure from rival Mercedes-Benz’s edgier, redesigned lineup. Porsche's operating profit rose by 13.9 percent to 3.9 billion euros. Sales revenue rose by 3.6 percent to 22.3 billion. The brand's operating return on sales improved to 17.4 percent from 15.8 percent. Seat brand swung to profit in 2016 with an operating profit of 153 million euros after a loss of 10 million euros last year as sales revenue increased by 3.8 percent to 8.9 billion. Cost reductions and improvements in the product mix, particularly as a result of the success of the new Ateca, more than compensated for negative exchange rate effects. The brand's operating return on sales was 1.7 percent. Bentley's profit was 112 million euros, compared with 110 million in 2016. Sales revenue rose by 4.9 percent to 2 billion euros. Its operating return on sales fell slightly to 5.5 percent from 5.7 percent.